Anybody else feeling the pain at the pump? Gas prices have risen each of the last 32 days bringing the prices up around 50 cents per gallon so far in 2013. These fluctuations in crude oil trap Americans and nearly all aspects of the country’s economy as this energy monopoly devastates business bottom lines and consumer pocketbooks. Meanwhile, big oil companies continue to put up record profits, even as gas consumption has decreased, while also maintaining their hundreds of billions in annual government subsidies. Wouldn’t it be nice if there was an alternative to gasoline and its constant volatility stemming from few refiners and unstable nations around the world? That obvious question has a solution being produced as you read this post, American ethanol. 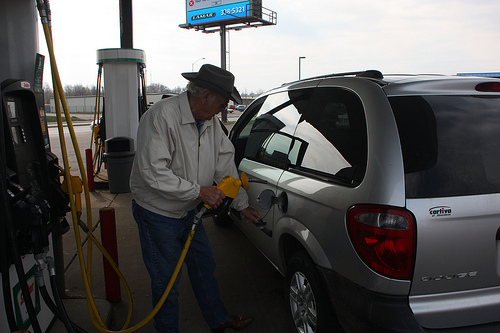 According to an Iowa State University study, ethanol is already saving consumers money, $1.09 per gallon on average in the United States and a $1.69 per gallon in the Midwest. Fair market access to the EPA-approved E15 or higher blends like E30 and E85 which could provide even more relief at the pump. Besides lowering gas prices, ethanol has created nearly 400,000 good-paying American jobs, billions in new tax revenues, reduced greenhouse gases and other nasty emissions while also lessening the nation’s dependence on foreign oil. It’s time for America to provide relief to consumers by relinquishing the 90% gasoline mandate, giving fair market access to clean, renewable, alternative energies being domestically produced. This entry was posted in News and tagged Big Oil, corn, ethanol, gas, South Dakota.